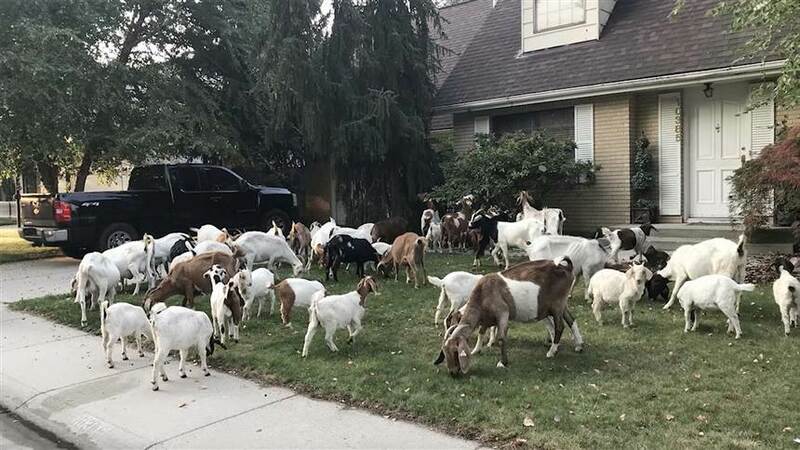 Residents in West Boise, Idaho, were surely dumbfounded Friday morning when they stepped outside their front doors to find dozens of hungry goats snacking through their yards. oe Parris, a reporter with local NBC affiliate KTVB, tweeted a series of photos from the scene, noting that neighbors had no idea where the animals had come from when they descended around 7 a.m. He further reported the munching goats took a bit of a toll on residents’ landscaping. Turns out, the goats did indeed have a place they were supposed to be. A business called We Rent Goats, which owns a swarm of 500-plus goats and rents them out to clean up weeds and brush up yards or pastures, had dropped off a herd of 118 goats at an area pond to do a bit of, well, maintenance.